With the recent unveiling of the Gladiator, we figured there would be some cool truck concepts prepared for Easter Jeep Safari this year. What we hadn’t planned on was every concept vehicle being a truck, yet it’s a very welcome surprise. At a glance the 2019 lineup is all about heritage and hobbies. From the restomod 715 and Scrambler revival, to rock climbing and overland themed Gladiators, there is something for everyone. More importantly, many of the parts you see on these concepts will be available upon the Gladiator’s launch, and even more are in prototype phase and may be offered later. So let’s dive right in, and see what the future might hold for Gladiator owners. Of course we’re going to start with the Wayout, how could we not? According to FCA it’s a “ true overlanding vehicle that takes advantage of the all-new Gladiator’s class-leading payload to allow adventure-seekers to go far off the beaten path,” which I’d have to agree with. Here’s what I love about this truck, besides how obviously cool it looks. 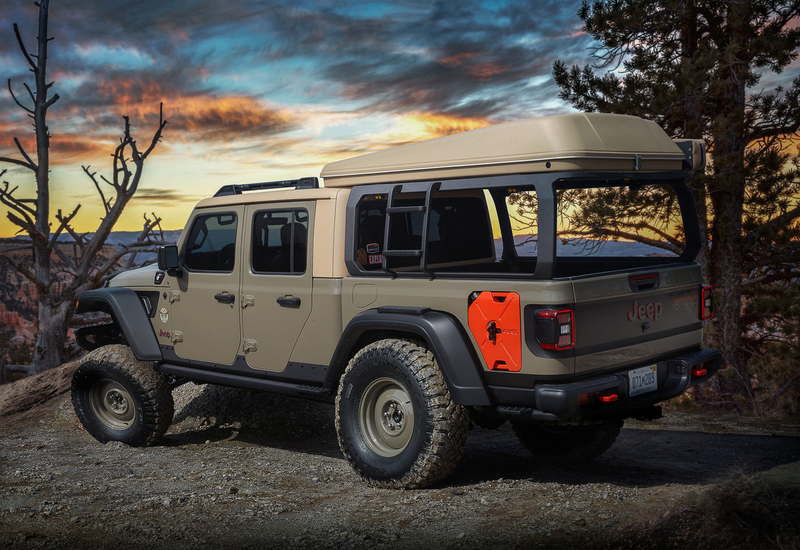 Unlike most of the previous EJS concepts, you will pretty much be able to build this Jeep for yourself. It’s painted in Gator Green which will be available as a factory paint color. 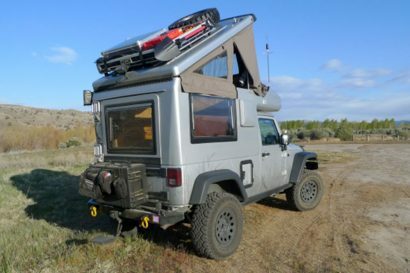 It utilizes an Autohome Maggiolina tent, albeit painted tan, and a custom bed rack with integrated ladders that will almost certainly be available through the aftermarket in no time flat. The 270 degree awning is pretty standard too, but with amber LED “task lights” to help you setup camp after a long day on the trail. The ARB on-board air system is already available, and the body-mounted quick disconnect air line makes it easy to refill your tires after dropping pressure for difficult or rough terrain. Then there’s the suspension, wheels, and tires which once again will almost certainly be repeatable for any consumer. A Jeep performance parts lift kit raises this Gladiator 2″ over stock which helps it clear 37″ mud terrains wrapped around a gorgeous set of 17″ steel wheels. Seriously, between this and the Africa concept we’re going to need these wheels. A 12,000 pound Warn Winch is tucked into the front steel bumper, and a set of IPF Xtreme LED lights are present for improved visibility on those late night runs to camp. Of course, an overland concept wouldn’t be complete without a snorkel right? In addition to the bed rack, the roof is sporting a custom set of rails for housing additional cargo on long adventures. There’s also a Mopar and Decked bed drawer system installed, which keeps your gear organized and easily accessible, not to mention safe and dry. There are bed lined floors to resist dirt and make the interior easier to clean, plus a very cool set of brown leather seats with laser-etched inserts of topographical maps. Unfortunately FCA did not provide interior images yet, so we have to wait on showing you those. The only aspects of this build I feel will remain in the land of concept trucks are the auxiliary fuel tanks integrated into the bedsides. These would extend the Jeep’s range, and looks awesome, but probably require too much modification to make them realistic. Besides, I wouldn’t love the idea of someone rear-ending my Jeep and smashing two fuel cans into the vehicle. Yikes. In case you’re wondering, there is not a diesel under the hood of this truck. The Wayout is powered by the venerable 3.6-liter Pentastar engine and mated to an eight-speed automatic transmission. The 80’s is in, and the Scrambler is back! We loved the original Scrambler, but this latest rendition might be our new favorite. The iconic Punk’N Metallic Orange and Nacho body-side stripes beg you to blast 80’s rock with the top off, and the wheels are brighter than the smile you’ll have while your perfectly feathered hair whips in the wind. If you must drive with the top on, you can find solace in the fact that the freedom top has been painted in vintage amber, and will look darn good with your Levi jacket. Like all great 80’s trucks, the Scrambler sports a color-matched tube roll bar in the bed. This version extends the entire length of the rails though, providing owners with eight tie-down points to secure their cargo. There’s even diffused LED task lights built into the roll bar to illuminate the bed at night. Handy when you’re trying to pull a drink from your vintage Coleman cooler without knocking into the boombox. 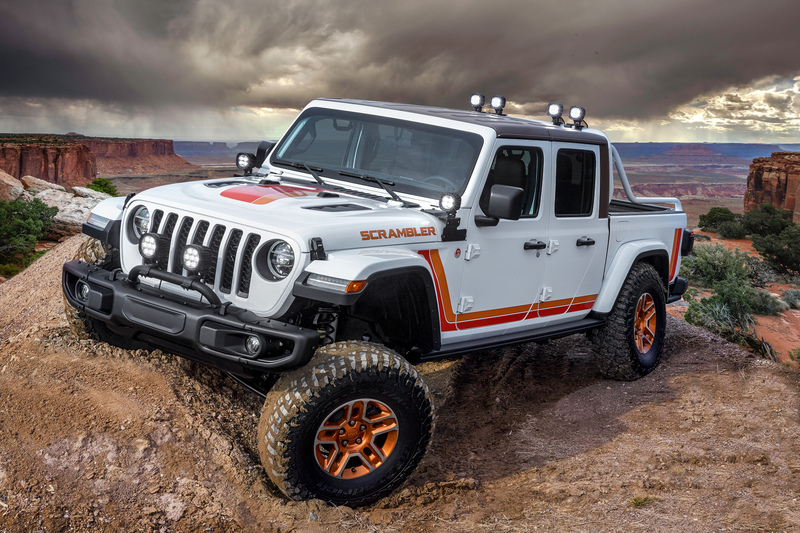 This Scrambler is based on a Rubicon, and uses plenty of Mopar’s Jeep Performance parts line including a set of four five-inch LED lights stationed atop the roll bar and two stationed on the vehicle’s A-pillars, plus seven inch LED lights on the brush guard which pump out 8,000 lumens each. It also features 17″ slot wheels, a 2″ lift, 37″ tires, and Jeep Performance part rock rails with non-slip grip. The Pentastar V6 gets a boost too, from a cold-air intake and cat-back exhaust. Inside the Jeep will have Katzkin Amaretto Brown leather seats bordered in orange thread, with the Jeep grille logo embroidered in a light Tungsten on the seat backs. The dash and armrests will receive the same brown and orange treatment. Finally, an auxiliary switch bank gives you easy one location control of all your lights and accessories. 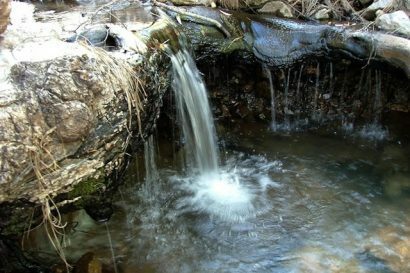 Now grab your favorite 80’s mixtape and lets go find a trail. I’m beginning to think that FCA has caught on to everyone’s love of the old full-size Jeeps, because we’ve got another one this year, and it’s based on the Kaiser M-715. This 1968 military truck was a descendent of the original Gladiator, but now shares little with the ancient predecessor. The front sheet metal was removed for example, and replaced by a full carbon fiber front end. Yeah a carbon-fiber Kaiser, who would have thought. HID and LED lights improve visibility, but also give the truck a distinctly updated look, while the original tail light buckets house LED halo lights. The factory bed was ditched for a custom bobbed 6-foot model made from aluminum, but we’re pretty sure you could have figured out that wasn’t stock for yourself. Something about the water-jet cut panels, perforations, and wood slats might have given it away. There’s also a 3.5″ drop to the convertible soft top to give it a sportier profile. Body protection is provided by new rock rails, and modified Gladiator Rubicon steel bumpers have been installed for protection, while tying the look together with the brushed metal body and tailgate. Any Jeep worth its salt should carry some off-road upgrades too, and this truck has them in abundance. The old leaf springs were replaced with a heavy-duty link and coil suspension system, bolstering the truck’s ability to articulate significantly. With this change they decided to reinforce the frame at the same time to prevent torsion of the vehicle. The front axle was moved two inches forward and replaced with a Dynatrac Pro-rock 60. The rear axle was swapped for a Dynatrac Pro-rock 80, and 20″ beadlock wheels were installed with 40″ tires to match. The interior, which once again we do not have pictures of, includes new Wrangler seats sans headrests, a lightweight instrument panel made from water-jetted aluminum components, and matching aluminum door panels. We’re really excited to get a peek at the repurposed vintage 8-71 supercharger though, which now serves to encase the transmission and transfer case shifters. 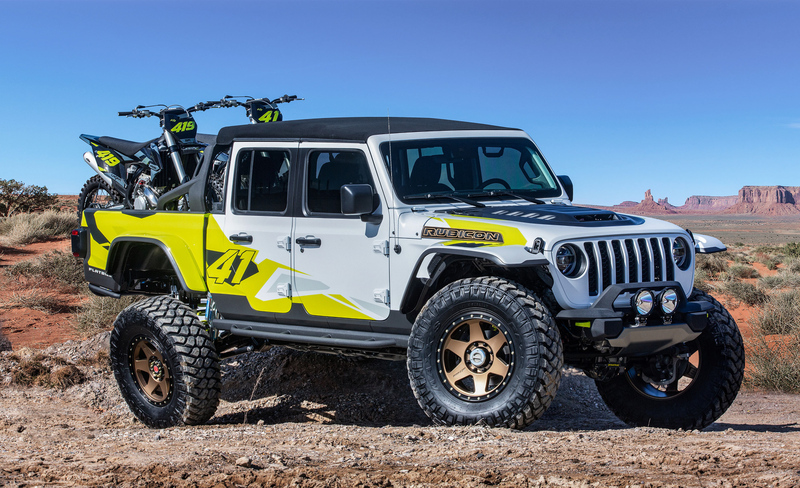 In case you didn’t already want one, we’d like to inform you that this old M-715 received a big boost in power from a 6.2-liter supercharged “Hellcrate” HEMI® V-8 engine, which Jeep says will produce more than 700 horsepower. Ridiculous? Probably. Fun? Absolutely. 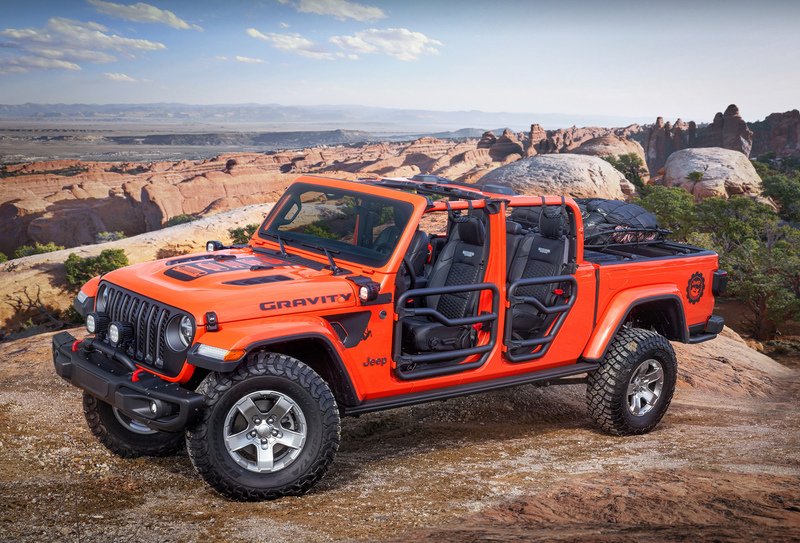 Another truck that is made with Jeep parts available at the Gladiator’s launch is the Gravity concept, which is inspired by rock climbers and their needs. 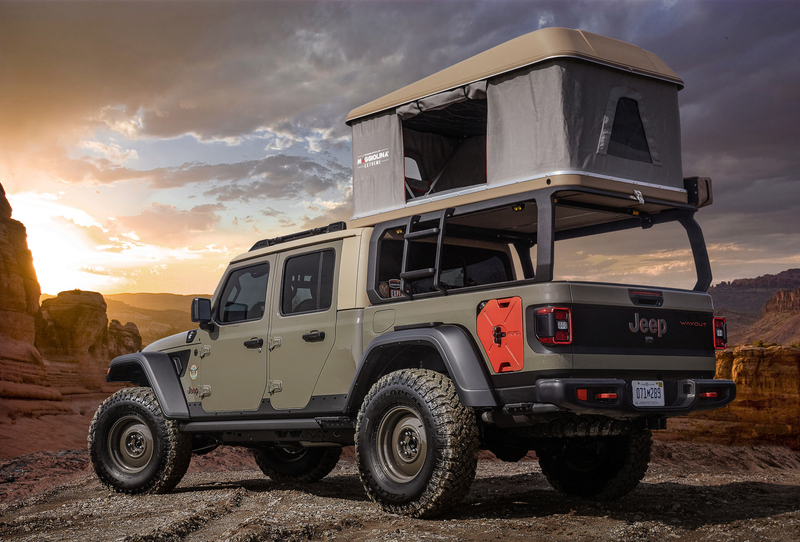 In the bed you’ll find a Mopar / Decked drawer system for lockable dry cargo space, as well as Mopar cross rails with a special basket to provide space for climbing gear like ropes, carabiners, helmets, and shoes. I wouldn’t put my ropes out in the dust and dirt unprotected as shown, but we get the idea. The top is fittingly missing for this concept, giving climbers the open air feeling they love to pursue on the wall. Two inch round steel tube doors continue this theme, matched by a mesh sunbonnet which provides shade without obstructing the open air feel. 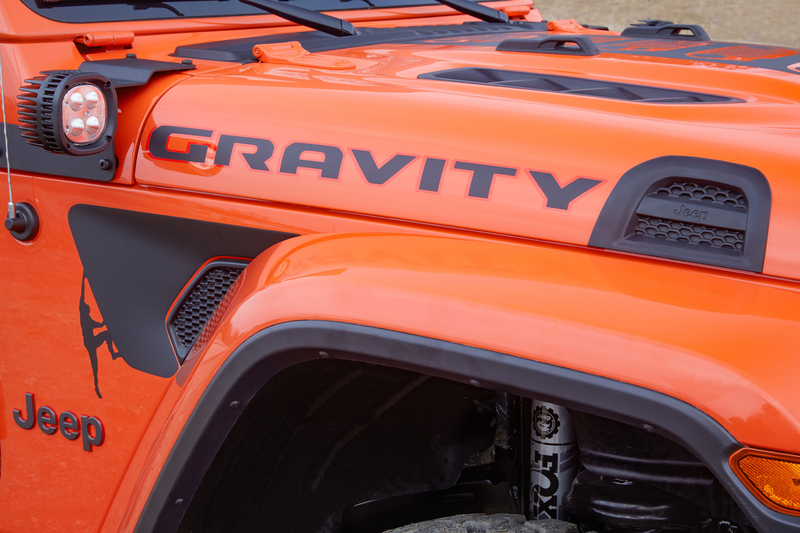 Off-road capability is enhanced with a 2″ lift and heavy-gauge steel rock rails from Jeep performance parts, which are thicker and wider than the originals. These have been coated in RAM truck’s bed liner to provide a non-slip finish. A cold-air intake and cat-back exhaust system enhance horsepower and torque, which helps turn the 17″ wheels and 35″ tires, giving the truck even more clearance while also improving traction and the overall look. Finally, night visibility is improved by Jeep Performance Parts seven-inch LED lights in front of the satin black grill, and five-inch LED lights mounted on the A-pillars. Inside, the interior is dressed up with Katzkin leather seats featuring the Jeep grille logo embroidered in Tungsten stitching. 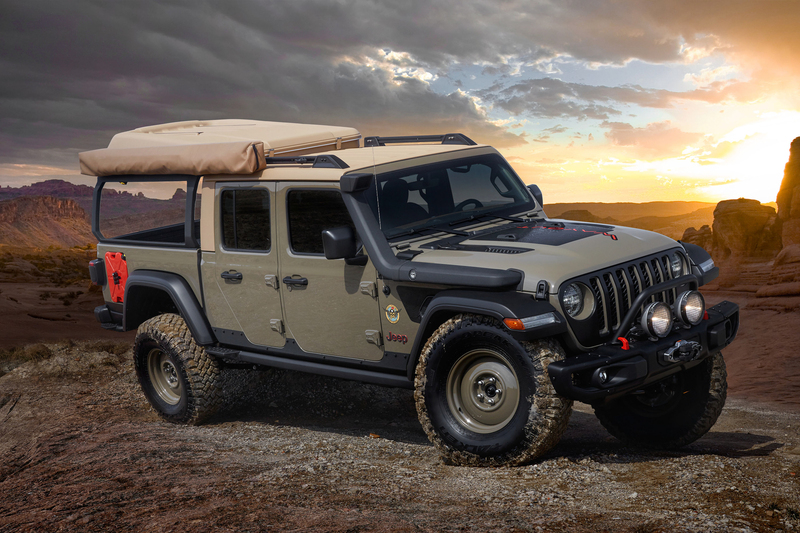 Additional Mopar accessories include grab handles stamped with the Jeep grille logo, MOLLE (Modular Lightweight Load-carrying Equipment) bags for storage and all-weather floor mats with a unique “plug” system that allows for direct draining of water and debris. All of you who have been dreaming of a two-door Gladiator can now collectively lose your minds, because Jeep has delivered with the J6. This Rubicon based beauty uses a two-door configuration to maximize cargo space with a six foot bed, that’s 12″ longer than the standard Gladiator. A retro feel is restored through the Metallic Brilliant Blue paint, a homage to the exterior look of the 1978 Jeep Honcho. Total length comes to 201 inches, with a wheelbase of 118.4 inches, identical to the current 4-door JL. The longer bed is protected by a prototype body-color matching spray-in bedliner, which looks great in contrast with the two-and-a-quarter-inch steel prototype sport/roll bar. This bar is tied into the bed itself, and carries four five inch Jeep Performance Parts LED lights which project 4,800 lumens each. Underneath you’ll find a 2″ lift kit providing clearance for 37″ tires wrapped around 17″ prototype beadlock wheels. A matching spare is located in the bed. 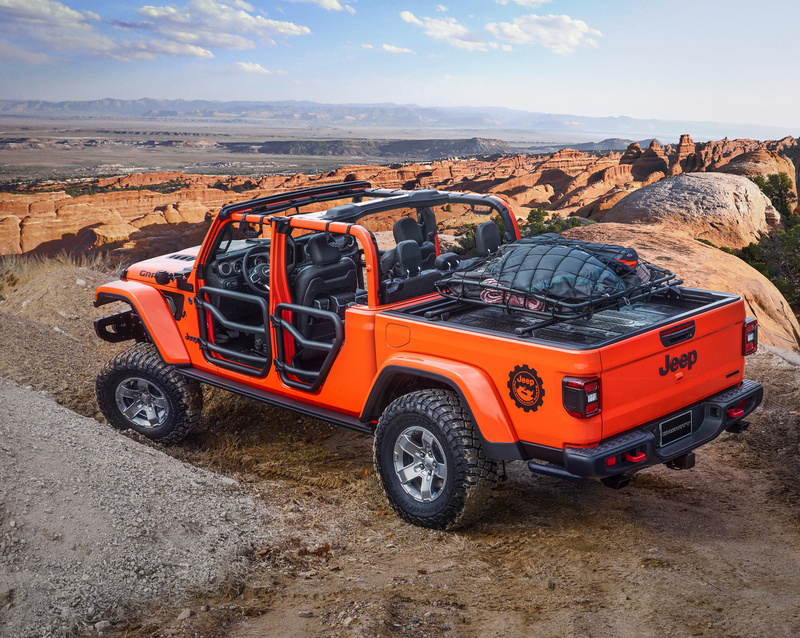 Armor includes a two-inch stinger bar which bolts directly to the Rubicon front bumper, and rock rails with two-inch steel tubes welded to the Gladiator rails. Thing stinger bar is home to four additional five inch Jeep Performance Parts LED lights with another two bolted to the A-pillars. Since this is a Jeep, the hard top is naturally removable. The same exterior cues of the J6 can be found inside. The instrument panel inserts match the body color, Katzkin leather seats and armrests are accented with body-color blue stitching, and the horn pad bears a Jeep badge. An auxiliary switch bank gives you easy control of all ten LED lights, and a trailer brake control switch gives the truck additional stopping power when towing. 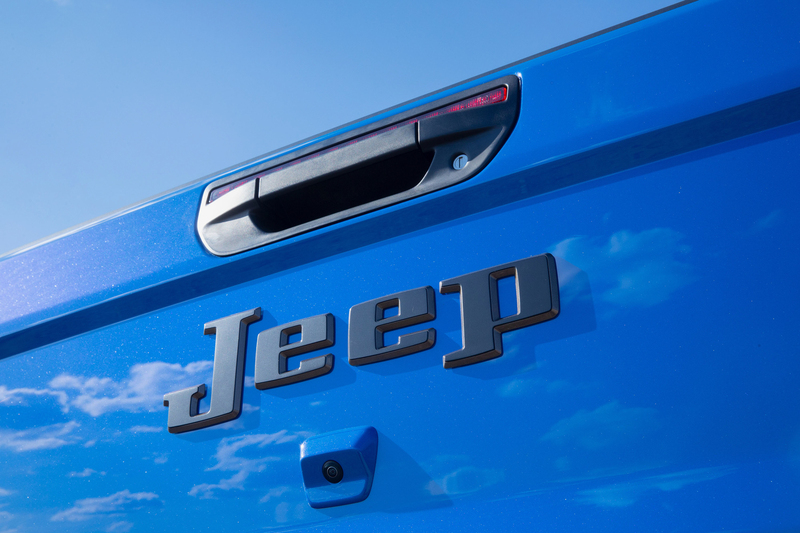 A bright pedal kit, all-weather floor mats and molded doorsill guards with the Jeep logo round out the lineup of Mopar accessories. 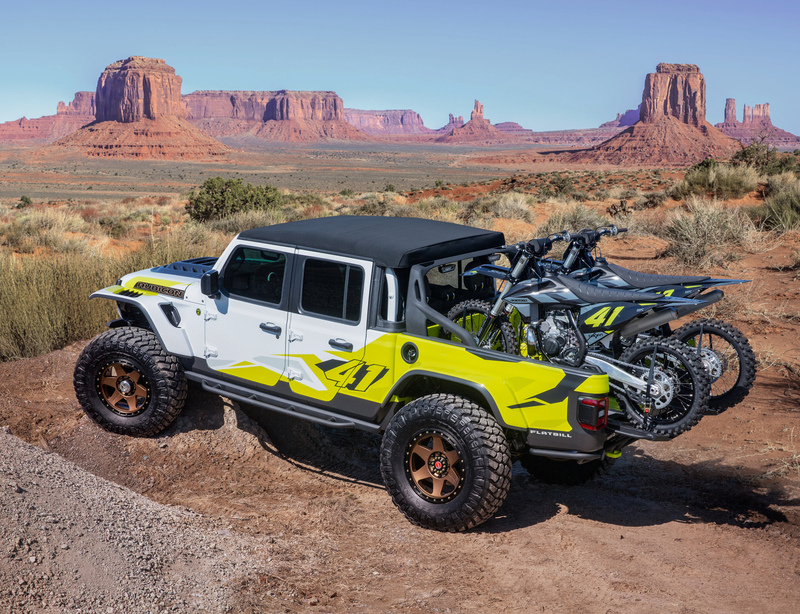 I almost can’t believe that Jeep named a concept truck with dirt bikes the Flatbill, but they have, and we love it. As you’d expect, it takes cues from the motocross world giving it a “loud and rowdy” appearance for anyone into the desert lifestyle. 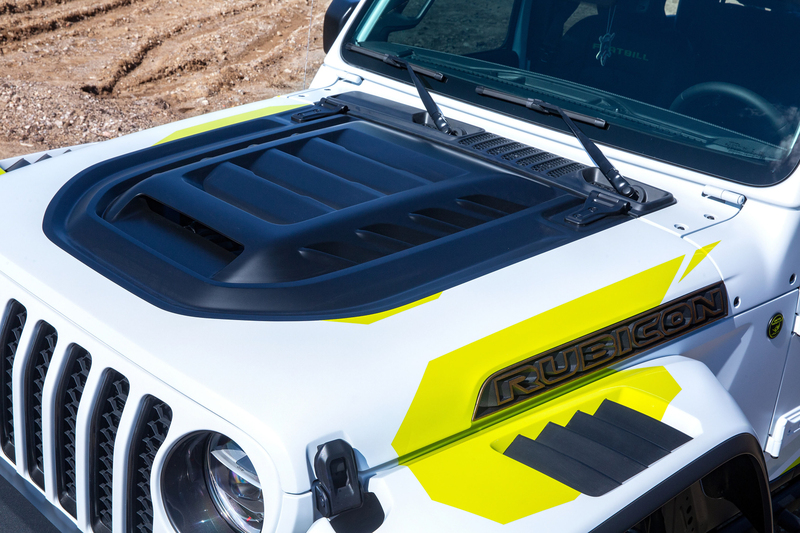 You’ll find a vented carbon-fiber hood with high-clearance fender flares for compression and articulation. A custom designed shortened front bumper and skid plate improve the approach angle, while also showing off the Dynatrac Pro-Rock 60 front axle. 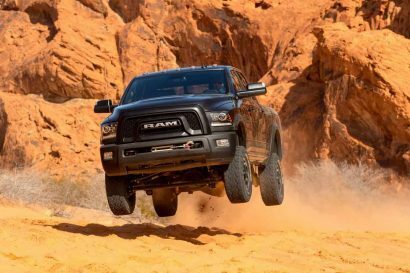 The rear carries a matching axle, which will help it turn the first 40″ tires ever fit to a Gladiator. These are wrapped around 20 inch wheels, which fit the desert scene nicely. In the bed you’ll find two dirt bikes ready to be easily removed or loaded via the dedicated wheel ramps that slide out from where the tailgate used to be. Custom body work on the bed lowers, plus the addition of a tube rear bumper, increases the vehicle’s departure angle for added capability, and there’s also a four inch lift with rear bypass shocks for high speed runs. Jeep chose to stick with the 3.6-liter Pentastar V-6 engine on this model, but paired it to a cold-air Mopar intake and eight-speed automatic transmission. We’ve still got some time before we can finally see these gorgeous concepts on the trail, but we can’t help but think they will steal the show in Moab. Stay tuned for more updates on these rigs, and additional information from EJS!